RBTH presents a selection of views from leading Russian media on international events, featuring reports on the seizure of Russian assets in Belgium and France, the dismissal of Ukraine’s security services chief Valentin Nalivaichenko, and Hong Kong’s rejection of electoral reforms. The centrist newspaper Nezavisimaya Gazeta is following the story of the seizure of Russian assets in Belgium and France. The publication reminds its readers that in 2014, the Permanent Court of Arbitration in The Hague obliged Russia to pay $50 billion to companies affiliated with former shareholders of the oil company Yukos. 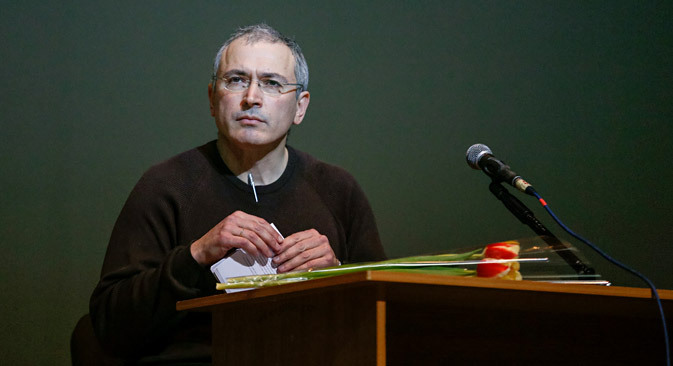 The court had ruled that Russia's actions in relation to the company [which was broken up after the arrest of Yukos CEO and Kremlin critic Mikhail Khodorkovsky in 2003 – RBTH] could be viewed as expropriation of investments. In turn, Russia categorically refused to recognize The Hague court's decision, the newspaper underlines. Russian officials announced that Russia completely excludes the possibility of paying the claims. At the same time Khodorkovsky has openly welcomed the decision to seize Russian property. Western media does not exclude that Russia will retaliate by seizing European property in Russia. Experts say that the wave of arrests of Russian assets could spread to other countries. "Even if Russia challenges the decision, it will most likely just lead to delays, without producing any substantial results," says chairman of Moscow's Arutyunov and Partners Bar Association, Alexander Arutyunov. According to Andrei Zelenin, partner at the Liding legal firm, Russia can certainly take retaliatory measures, but they cannot be arbitrary. "Retaliatory measures need to be based on serious grounds," said Zelenin. "The current arrest is based on a court decision," said Arutyunov. And if Russia tries to seize European property without a court order, this could lead to grave consequences, he warned. The business magazine Expert reports that the Ukrainian parliament, the Verkhovna Rada, has dismissed the head of the Ukrainian Security Service (the SBU) Valentin Nalivaichenko. The initiator of the dismissal was Ukrainian President Petro Poroshenko himself. The official version says that the former SBU head was not able to implement the orders of the Ukrainian president, and that Poroshenko was displeased with Nalivaichenko's work on the fight against corruption and smuggling, as well as with the activity of the SBU in the “anti-terrorist” operation against Russian-backed rebels in the Donbass region of eastern Ukraine. However, according to Expert, there are a number of unofficial versions of the story. Some say that Nalivaichenko had presidential ambitions. It is no secret that the U.S., the EU and Russia are beginning to have their doubts about Poroshenko, writes the magazine. The West is displeased by the Ukrainian president's reluctance to implement reforms and his desire to drag the United States and Europe into a full-fledged war with Russia. The Kremlin is extremely dissatisfied with what it claims is the Ukrainian government's “sabotage” of the Minsk peace agreements. Considering Nalivaichenko's close ties with Kiev's western sponsors, he could have easily been considered a presidential candidate, adds the publication. Moreover, Poroshenko could have removed Nalivaichenko from his post because he could not be controlled. "The president needs a more pliable SBU head," explained Ukrainian political analyst Vadim Karasev. The business daily Kommersant writes that Hong Kong stands on the threshold of new turmoil. The confrontation between the Chinese government and the democratic activists is moving into another phase after deputies of the Hong Kong legislative assembly refused to back electoral reform. Kommersant reminds its readers that currently Hong Kong's chief executive is elected by an electoral college, which includes members appointed by Beijing. As part of the rejected electoral legislation reform, the Chinese government was willing to abolish the electoral institute and move to direct elections, but on one condition: Hong Kong residents would be able to elect only those candidates that are approved by Beijing beforehand. This condition became the stumbling block between the Chinese government and the Hong Kong opposition, which since the beginning has called the proposed reform "a false democracy." The mass student protests that exploded in Hong Kong last year were directed against the Beijing plan. However, the Chinese government remained steadfast, saying that Hong Kong democracy, in its view, cannot exist without "the Beijing filter," writes Kommersant.